I picked up these two amazingly fantastic Corgi open wheeled cars at an estate sale recently, and thought they deserved a post. The first is Gordan Johncock’s famous STP livery 1973 Indy 500 winning car. While the race was an utter disaster that year, the cars were quite impressive. These big winged, turbocharged monsters of the 70's were among the first to hit 200mph at the Brickyard. Packed with what some estimates say were 1,000hp, these oval cars marked a golden era of Indy car racing. Corgi did a great job of capturing the details of the car, from the huge wing down to turbo sticking out the rear. The suspension and stance is just right, and the car’s sturdy diecast body gives it a good weight. 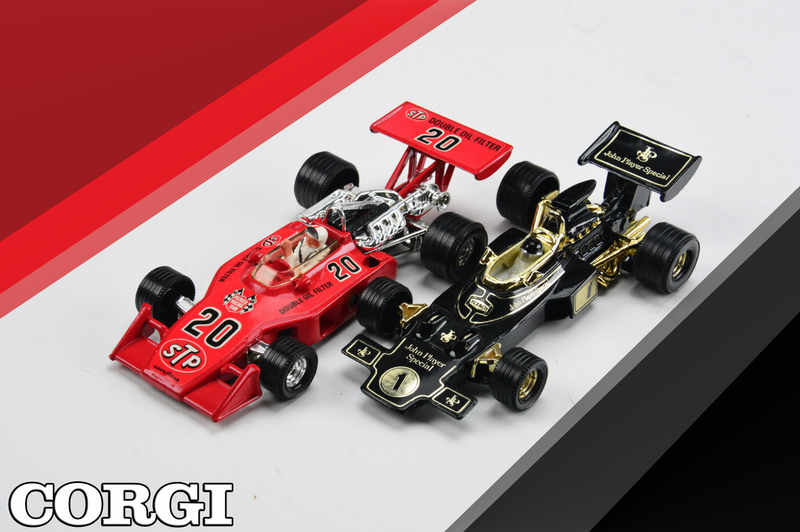 The second Corgi model is a black beauty in one of the most notable F1 liveries in the history of the sport. The 1973 Lotus-Ford cars featuring the John Player Special livery helped push the Lotus to victory so often, that they took home the 1973 Manufactures Cup, and are among some of the most spectacular looking liveries in motorsports history. Once again, Corgi nailed the look. The gold accents, the smooth trailing lines of that famous Player livery, and that low-slung stance...jackpot. All that’s missing are some grandstands in the background and it’s 1973 again.